I do have some original thoughts coming, honestly. But in my jet-lagged laziness, it is pretty easy to post beautiful things I have seen on other blogs, even though you may have seen them before. I couldn't resist posting this typewriter photo, which I spotted on This is Glamorous. I love typewriters, and their popularity in the blogosphere. 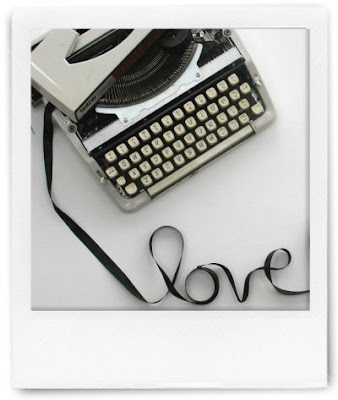 * Here is a recent typewriter post about Olivetti Valentine posters from Inspiration Chic. And if I ever get married, I would like to do something similar to these typed wedding invitations. Once upon a time, perhaps three years ago, I saw a print of a typewriter for sale in Anthropologie, and I wish I had bought it. If anyone has one lying around, unloved and unappreciated, please do let me know. *Other observations about the blogosphere; a huge interest in letterpress, and 2009 calendars. I don't know anyone in the UK who has expressed much of an opinion on either; but I may be wrong. Anyway, I am now totally on the letterpress bandwagon - and am especially in love with these cards from Simplesong. I'm less interested in calendars, unless they are advent calendars with chocolate inside. Come to think of it, I haven't seen many of those cropping up yet in the blogs I read - perhaps that will be my original thought. Hi Lynne- Just wanted to let you know I sent an email your way, in case it gets sent to spam. It is funny how most bloggers seem to like the same thing. I guess we are all of the same breed!